Pages like Careers and Contact Us with forms and respective processing associated with each. Find a loan center – Allow the users to look for Cashtime loan centers and their associated details. The locations data was retuned using a web service and was rendered dynamically along with a Google map also to show the respective locations. Get directions – The user could enter their own location and get directions to the selected loan center using Google Directions API. 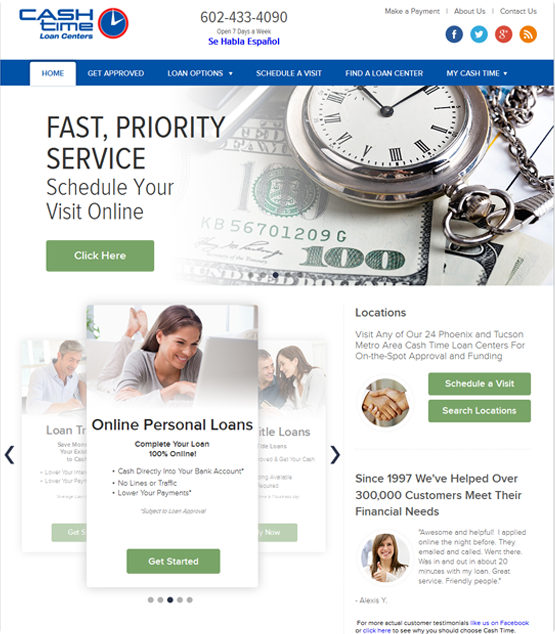 Schedule appointment- User can select a loan center, fill in their own details along with appointment date and time and book an appointment as per the loan center’s working hours and the still available slots. Get Approved Now – Functionality was to get a loan approved online by filling in the step by step details as presented on the screen. Apart from the above the website also has a custom blog section, the content for which would be added by Cashtime through Sitefinity CMS.